The Academy P-38 Lightning is one of the nicer renditions of the fork-tailed devil produced in 1/48 scale. It wasn't surprising that they'd reissue their kit with the appropriate parts to render the P-38F and in impressive decal sheet to meticulously replicate this beautifully restored aircraft. Bear in mind that there never was a P-38 named 'Glacier Girl' in World War II as this was the nickname given the aircraft after is was found under the ice 60 years later. The decal sheet has THE most extensive set of maintenance stencils I've ever seen on a P-38 and should keep you busy for quite some time. The Glacier Girl also wears her FAA registration number NX17630 as a legal airworthy warbird and these are provided on the decal sheet as well. The Academy P-38s are definitely nice kits that build up into beautiful models with a little care and skill. This decal set alone is worth having for any P-38 project as you won't find many model companies printing multicolored decals without multiple layers like this much any more. Author David Hayes doesn't flinch when telling his story in this book. He does this group proud and airplane aficionados will examine every page, including the hundreds of beautiful color photos. Visit the section of our website dedicated to this amazing story for lots more. It is one of the most remarkable stories of aviation treasure hunting in history and an unforgettable saga of modern arctic exploration. On July 15 1942 a squadron of two B-17 bombers and six P-38 fighters bound for Iceland crash-landed in Greenland after becoming disoriented in a blizzard. The crews were rescued but the planes remained eventually entering aviation lore as the "Lost Squadron." In 1981 two explorers from Atlanta set out to find these planes and restore them to their former glory. In this riveting tale of adventure History Channel reveals how simply locating the planes took a painstaking eight years. Then when the planes' location was finally uncovered the WWII machines were found to be encased in ice 250 feet below the surface of a glacier...and that was just the beginning of the difficulties the team would face. 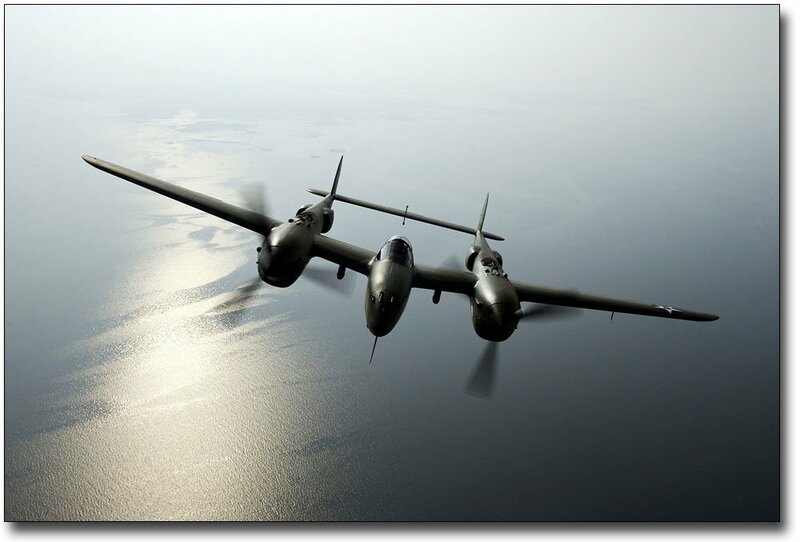 From the remote vastness of Greenland to the Kentucky runway where the P-38 Glacier Girl took to the skies once again History Channel presents a fascinating account of THE HUNT FOR THE LOST SQUADRON. A thing of beauty to behold. If you're a fan of "Glacier Girl" (or any P-38 at all!) this is the classic and beautiful photo you want hanging on your wall.